Do a favor by stealing an item. This is a radiant quest which you can receive from any and all of the three following people. The quest item and its location is uniquely determined by the quest giver. Speak to the quest giver. Dengeir of Stuhn was once the Jarl of Falkreath but has since stepped down and is now a Thane. He is a paranoid and patriotic supporter of the Stormcloaks. He believes that Lod the Blacksmith is writing a treasonous letter and wants you to steal it for him. The letter is on Lod's bedside table. It is a note requesting extra iron supplies. Steal it and return it to Dengeir. Dengeir will at first be confused, and then realize Lod is probably not up to treason, even if he is making extra weapons for the Empire. He will then give you a reward of leveled gold. Completion of this quest opens up another radiant quest, Dark Ancestor. At the end of this second quest, you will receive leveled gold. Talking to Malur Seloth and asking him what he does prompts him to reveal that he doesn't really do anything. He wants to appear more mage-like when in the jarl's presence, and wishes to acquire a staff. The one he wants belongs to Nelacar who resides in the inn. 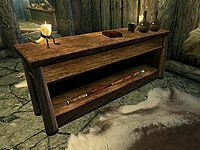 The staff is located in the shop counter in Nelacar's room—you must steal it and return to Malur. He will reward you with one skill point in Speech. When speaking to Stands-In-Shallows, he mentions that some pirates were caught smuggling extra powerful Skooma, and he would like to get some. The bottle is located in the New Gnisis Cornerclub in Windhelm, underneath the second set of stairs. Steal it and return to Stands-in-Shallows, who will reward you with a skill point in Sneak. For Malur's quest, the staff will be present from the beginning of the game. If you steal it before beginning this quest and then sell or store it, you will still complete the quest and receive the reward by choosing the option to give Malur the staff. The same is true for the Double-Distilled Skooma and Stands-In-Shallows. This quest requires you to commit a crime; see that page for details about criminal activity. The quest might not trigger if you have already stolen the quest item. Since the quest item is marked as such, you are left with no way of getting rid of it. ? The following empty quest stages were omitted from the table: 0, 20, 200. On the PC, it is possible to use the console to advance through the quest by entering setstage Favor018 stage, where stage is the number of the stage you wish to complete. It is not possible to un-complete (i.e. go back) quest stages, but it is possible to clear all stages of the quest using resetquest Favor018. This page was last modified on 12 September 2018, at 19:37.